Liberty (YAL) chapter, thanks to campus activist Ocean Dylan Andrew — and a little help from the Advocates’ OPH (Operation Politically Homeless). Ocean had wanted to start a campus YAL chapter for a long time. When a change in university policy allowed him to table for recruitment, he jumped into action. “I decided the Operation Politically Homeless kit from The Advocates for Self-Government would be best for recruiting,” Ocean wrote at YAL’s home page. Things were a bit slow at the booth at first. But then… OPH began working its magic. OPH is a fantastic way to turn an ordinary, dull outreach table into a crowd-drawing fun event. From the very first time the Advocates introduced OPH, some 25 years ago, users have told us over and over again that OPH brings their outreach booth and tabling efforts alive. OPH makes it easy and fun to discover libertarian-leaning individuals and sign up new members, supporters and activists. OPH utilizes the crowd-drawing and mind-opening power of the World’s Smallest Political Quiz and eye-catching graphics. OPH makes your booth the most active, the most talked about, the most fascinating, at any event. And it’s fun and easy to do — a great outreach event for newcomers and veteran activists alike. 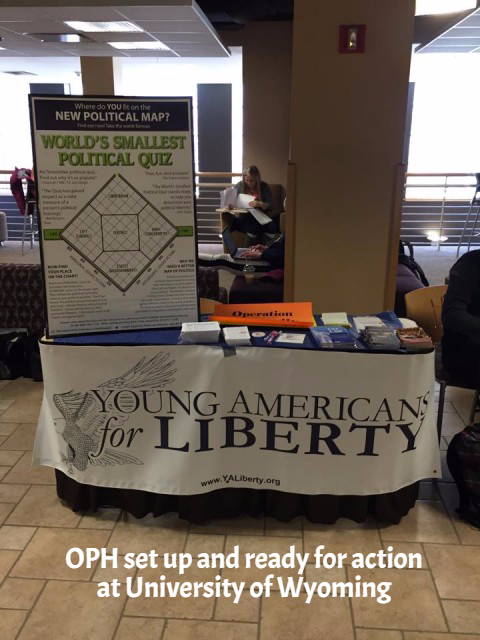 As I mentioned, in the past few years the Advocates has given — completely free of charge — over 1,000 OPH booth kits to libertarian campus organizations across America. These kits have reached tens of thousands of students with the ideas of liberty, and they will continue to do so for years to come. Student groups: Learn more about OPH — and how you can get your FREE OPH kit — if you haven’t already — here. Non-student libertarian groups: Learn how to get an inexpensive, crowd-drawing OPH kit for your organization. Spring is here! It’s the perfect time for libertarian groups — student and non-student alike — to use OPH to discover new libertarian-leaning folks and invite them to join our movement for liberty that is changing the world. What is the Libertarian Alternative to Zoning?